Alejandro Miranda-Sousa, M.D., is a Board-certified urologist at Urology Experts, a premier three-location practice in Southwest Florida. Recently named a Top Doctor by Castle Connolly Medical Ltd. and a Diplomate of the American Board of Urology, Dr. Miranda-Sousa has written and co-written several award-winning clinical and research papers. Today, he specializes in urinary incontinence, bladder stone prevention, urologic oncology, laser surgery and much more. It is also Dr. Miranda-Sousa’s passion to use the most advanced technology and surgical techniques in all areas of his practice. Traditionally, ginger has been used in treating digestive disturbances of the gastrointestinal tract. Ginger exhibits a similar effect as stimulated serotonin receptors do in providing digestive relief. As a carminative herb, it reduces intestinal gas and provokes gut motility. Ginger has been known to aid expectant mothers experiencing “morning sickness” as it reduces nausea, alleviates motion sickness and reduces fever. Prostate enlargement and prostate cancer are serious problems primarily for older men, as the likelihood of getting the disease increases with age. Prostate health is important as without it men cannot produce seminal fluid, the main carrier of sperm cells. Prostate cancer is second only to skin cancer and affects one in six men in the U.S. The 2017 report of the American Cancer Society estimates 161,360 new cases of prostate cancer this year. Ginger should not be used alone in treating or preventing prostate cancer. If you are experiencing symptoms or would like to know more about preventing prostate cancer, you should seek out a board-certified urologist to determine the best course of treatment. suppress inflammation and aids in the support of the natural pain relief process. With its anti-inflammatory, anti-parasitic, anti-viral and anti-bacterial properties, ginger has become one of the most powerful ‘superfoods’ sought out today. 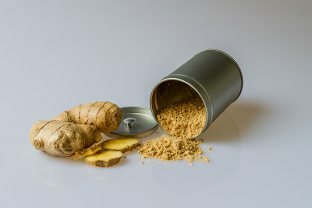 Including ginger into your daily consumption pattern supports healthy liver detoxification as well as aids in digestion. Incorporating it into juices, smoothies, salads or as many prefer, hot tea will allow you to experience all the benefits ginger has to offer. But, keep in mind, consuming too much can have side effects such as stomach upset, heartburn and gas, so it is best to experiment to determine how much you can tolerate daily. Dr. Alejandro Miranda-Sousa and his staff have the urological experience and expertise to help you. Call (239) 226-2727. Online at UrologyExperts.com. If you are experiencing symptoms or would like to know more, please contact us.